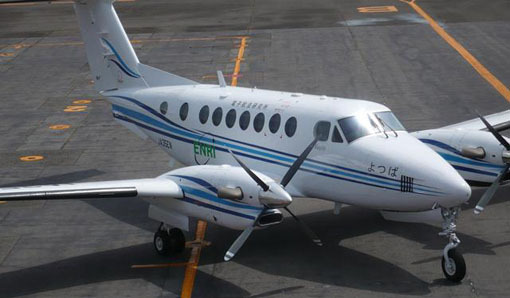 The Electronic Navigation Research Institute conducts various field tests of next-generation air traffic control equipment at Sendai Airport, which is one of Japan’s international airports. During the technical tour, we will visit the site of air traffic control at Sendai Airport and observe things such as airplanes used for aviation experiments, a new airplane monitoring system that uses RoF, and demonstrations of next-generation air traffic control equipment. The tour is planned to last approximately 3 hours. 1. Transportation fees to and from the airport are to be covered by participants. 2. Advanced registration is required because the capacity of the facilities is limited. 4. When your registration is completed, a confirmation e-mail will be sent to you. 5. Early application is recommended since we expect many applications. Sendai Airport is an international airport located approximately 15km south of central Sendai City that faces the Pacific Ocean on its East side. It was submerged due to tsunami after the Great East Japan Earthquake on March 11, 2011, but as a result of cooperation by the related departments, a portion of operations resumed on April 13, 2011 and on July 30, 2012 it was fully restored. The Electronic Navigation Research Institute Iwanuma Branch was established next to Sendai Airport in October 1976 in order to protect the safety of air traffic and evaluate new air traffic control facilities such as air traffic control and the communication, navigation, and monitoring technology, etc. that supports it. It currently evaluates systems that have been experimentally produced and developed by the laboratory, such as airplanes used for experiments and airplane monitoring equipment that uses Radio over Fiber, etc. This is a flying laboratory that conducts aviation experiments for various kinds of equipment. This is a system that uses Radio over Fiber technology to receive radio waves emitted from airplanes and monitor airplanes that move within the airport. Notes: Conference registration is required.